Flowers have been an enduring source of inspiration for quilters; many traditional quilt blocks feature flower patterns. The remarkable array of miniature wildflowers that can be found in the Columbia River Gorge and surrounding hills of the Cascade Mountains inspired my series of flower designs. Based on the design and piecing techniques of Ruth McDowell, these designs take traditional patchwork a step further through the use of unexpected fabric choices. Join us in celebrating the beauty of flowers. We will learn the basics of Ruth piecing techniques and her fascinating use of fabrics. Selection from one of pieced flower patterns in my Flowers of the Gorge pattern series (available in class). You will see that my patterns combine a wide selection of fabrics that enhance the look of the quilt. The image (such as a chicken, flower or bird) will use anywhere from 6-15 different fabrics, mostly in small pieces. Some fabrics will be repeated in the quilt, others may appear only once. The backgrounds will also typically feature 3-6 different fabrics that have a similar look. In some instances we will be looking for specific features in a patterned fabric — for example something that suggests the shape of an eye, or feathers, or fur or a stem. Patterned fabrics with multiple colors add texture and dimension to the quilt. We will be playing with different combinations to see how these fabrics look next to each other. Having lots of patterned fabric choices from which to choose is part of the creative process for these quilts and helps bring these designs to life. It’s the seemingly odd combinations of fabrics that bring texture and depth to your quilts, and will work well. BRING LOTS!! Lots and lots of patterned fabric. A fat quarter or less is probably as much as you will need of any one fabric. Bring you largish patterned fabric scraps (though the strips found in jelly rolls are often too narrow). I routinely pull 50 or more fabric choices from my stash for the main subject of my quilts and additional fabric choices for the background. Having a wide variety of fabric choices to key to this style. 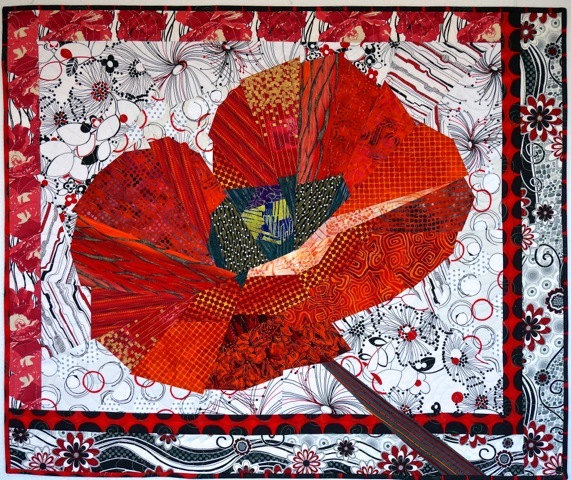 When choosing colors, keep in mind that a red poppy will also have bits of orange and yellow, and perhaps hints of purple and gold and green in it, so look for fabrics that have hints of other colors. BRING YOUR STASH!! However, note that we will NOT BE USING solid or tone-on-tone fabrics that “read” as solids. Large prints, medium prints, small prints, batiks, plaids, stripes, prints with many colors, bold fabrics as well as pastels — I pull them all. Each different kind of print will add something different to the overall look of the quilt. Look for printed fabrics where the print clearly contrasts with the background. Before class, visit my website and spend some time looking at the range of patterned fabrics used in my quilts to get an idea of what to bring. www.AnnShawQuilting.com Also look at Ruth McDowell’s website to look at the fabrics she uses in her gorgeous quilts. For large Poppy pattern, you will also need First Aid Cloth Tape to tape the freezer paper together. Design Wall: Bring to class a foam design board (30”x40” or larger). They are inexpensive and can be found at your local office supply store. audition individual fabric selections. Its then easy to carry your project home. Sewing machine and Supplies: (bobbins thread, needles etc). If you have a small digital pocket camera, bring it! Using the camera on your phone or tablet will work as well to audition fabric selections.